ZMP's e-nuvo WALK runs a robotic version of Microsoft Windows. Just as Microsoft unified the PC operating system market with the introduction of Windows 3.0 in 1990, so it may be about to do the same for robotics in 2008 after the introduction of the first MS-powered bipedal robot. 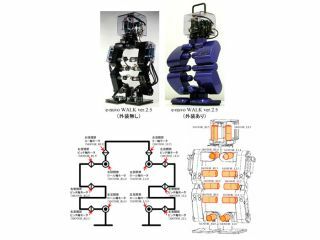 That honour was bestowed yesterday on e-nuvo WALK from Japan's ZMP - a two-legged kit robot that will cost ¥588,000 (£2,580) when it goes on sale in January. The software driving the device is Microsoft Robotics Studio, a development platform Microsoft introduced in December 2006. E-nuvo WALK is 35cm tall, weighs 2.5kg and can be controlled direct from a PC or with a handheld unit like the Xbox 360 controller used at yesterday's Tokyo launch event. It has six motors in each of its powerful-looking legs, although its absent head makes it look less than cute and more like the programmer's toy that it is. Tandy Trower of Microsoft's robotics division explained the company's vision, saying, "We think that this is the natural evolution of PC technology; that PCs will start to get up from our desks and move around and interact with us in a richer way." ZMP and the MRS platform may not have created the most sophisticated machine around, but if they do for robots what Windows did for home computers almost two decades ago, then we're in for a lot more mechanical friends in the near future.